Most of you will be familiar with my TR6 commonly known as the Flying Banana for obvious reasons. I had the car for almost 20 years and Yvonne and I decided a change would be as good as a rest. [ Nothing to do with creaking knees, back twinges or the Triumph Water Torture drip over the right shin]. 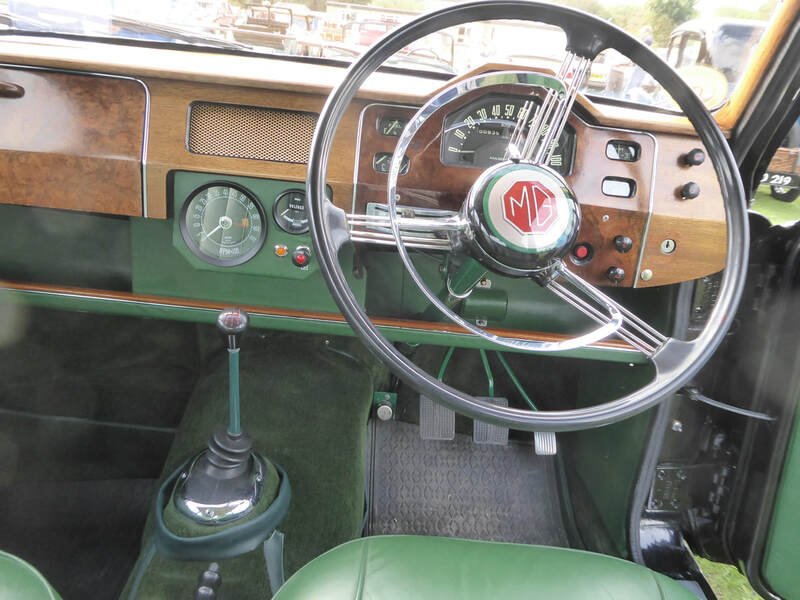 I had been looking for the right Magnette for around 10 years purely to feed nostalgia as my father had an example back when they were cutting edge. Having looked at several so called excellent cars I had almost given up when I had a call from a prominent Classic Dealer from Warwickshire who asked me if I was still in the market for one. He was very interested in taking my TR and the very fact that I have only room for one classic under cover the interest intensified. Following viewings at Balsall Common and Worfield a deal was struck and in September I acquired the new Lady in my life. SSC 555 is a 1958 Varitone produced as Black over Black with Green interior. Single colour Varitones were available to special order from Abingdon and she was supplied to John Gibson & Sons Ltd of Edinburgh, on the commission of a Mr S. Garrett, the Solicitor General to the Supreme Court of Scotland. 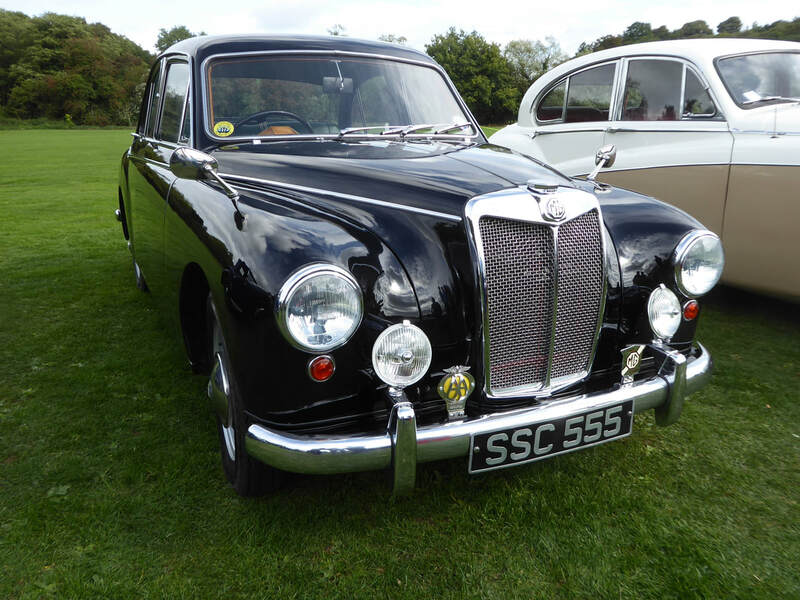 On his demise the Magnette was handed down to his daughter, Lady Marion Hume, the wife of Sir Alan Hume, Secretary of State for Scotland. Certainly a prestigious start in life for the car. 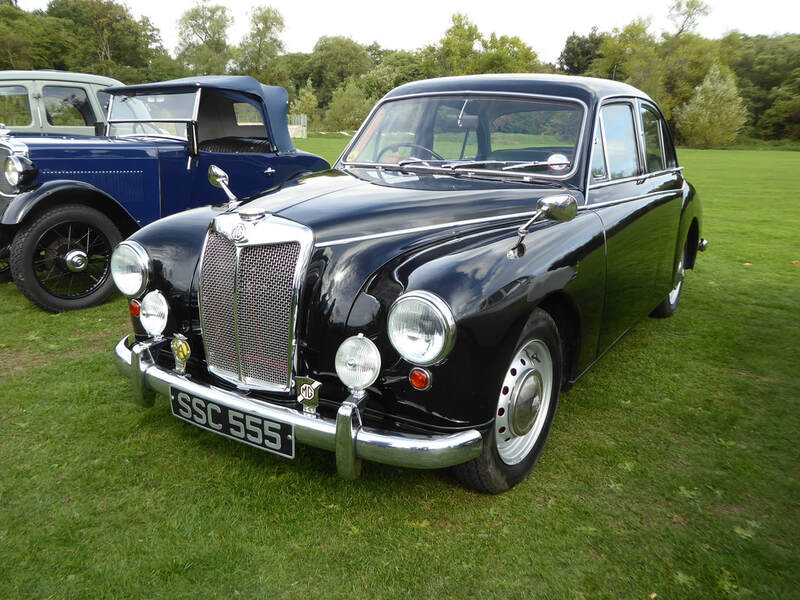 It remained within the family until 2003 when Lady Marion died and Sir Alan , then aged 93 sold her back to the ex-Manager of the supplying Dealership. Malcolm Oswald had indeed looked after the car most of its life and he had decided to renovate it for his own use. He was quite happy with mechanical side and over the next 12 months completely renovated the structure and bodywork finishing with a bare metal re-paint in its original black, this time using more modern paint rather than the factory cellulose. Personal circumstances decided that lasting custody was not to be and the car went to a new owner in Hampshire. He ran it until 2012 and then sold it locally at auction. It was bought by Bill Postins the dealer from Balsall Common. Almost immediately it was sold to a Gentleman by the name of Ross Ramsay and literally went back to its roots this time in Dunblane. Ross had retired from a long term involvement in Motor Sport Preparation with his brother and they had at one time been involved with Jim Clark Motor Racing until Clark’s premature demise in a racing incident. Ross Ramsay spent the next six years mechanically renovating SSC with literally a full nut and bolt restoration. When back to a shell he sealed, waterproofed and painted the underside but retained its exterior paintwork from 2004. Upgrades, modifications and other changes are far too numerous to list chapter and verse, however the complete history of the car together with what must be every invoice for renovations, servicing and replacements are contained in 2 lever arch tomes and make for interesting reading for an aficionado. Brief changes include. 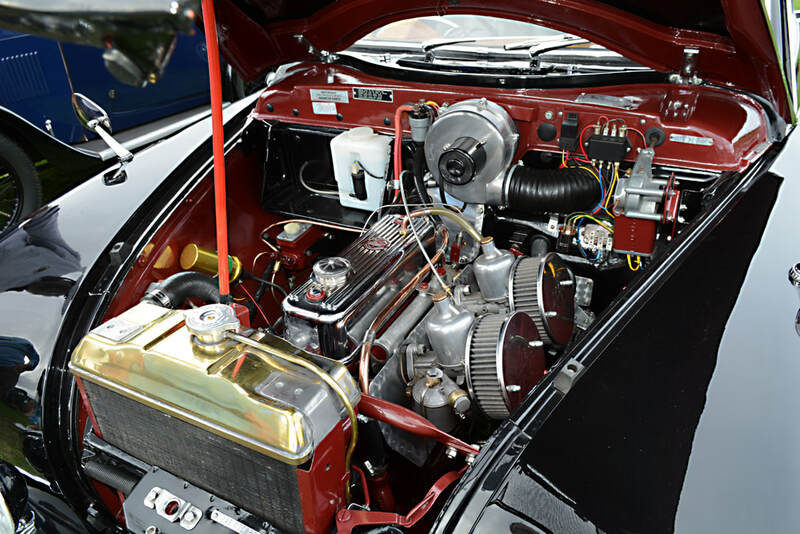 Engine bored out to 1622cc and rebuilt to full MGA spec. Cylinder head valves size increase with unleaded seats and fully gas ported. Flywheel and clutch lightened and balanced. Gearbox fully reconditioned to original spec but the differential replaced with a 3.9:1 unit from a later MGB. The replacement, recalibrated speedo unit now indicates almost 20mph per 1000 rpm in top gear. The car now boasts around 90 BHP, accelerates briskly and is well capable of keeping up with modern road conditions. You may ask why Ramsay did not keep the car after so much effort and expense. His answer to me was that although he liked it he didn’t love it and so it came to me. Incidentally Bill Postins supplied him with an MGC in exchange for SSC and that is now going through a similar process. This is Eric, a 1969 4.2 litre series ii ‘E’ Type Jaguar. Been in my ownership about 6 -7 years. Like most small boys at 12 yrs old you fall in love with the cars of the day. My day was the launch of the very glamourous ‘E’ Type Jaguar in 61. That particular car was a LHD Coupe reg no 9600 HP launched at Geneva Motor Show, closely followed by the first Production Roadster 77 RW. This roadster appeared as the getaway car for Pippa Middleton’s Wedding day. 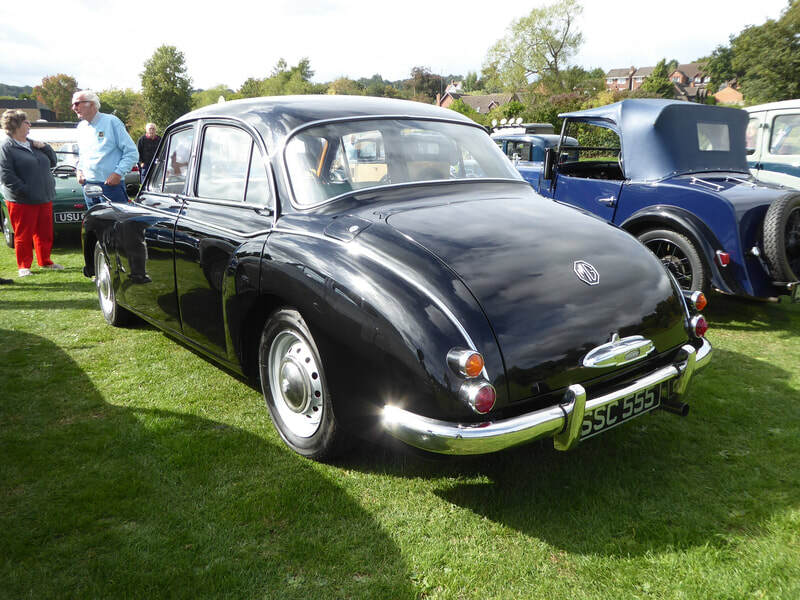 The Coupe was acquired (in a sorry state) and restored by the owner of the ‘E’ Type Club, Philip Porter. Philip also owns 848 CRY the Red Roadster from the Michael Caine Film ‘The Italian Job’. There is a great phot of Caine belting it with a crowbar after the bulldozer had had it’s way. He thought it wasn’t damaged enough. Fortunately after a few near misses I managed to pluck up enough courage to buy one albeit not the most valuable of the marque. Sadly, I missed celebrating Eric’s 50th Birthday. I thought it was 15th September ‘69 when he was manufactured. I just sent off for the Jaguar Heritage Certificate of authenticity and noticed that 15 SEP was his first UK owners cherished registration. Eric’s real 50th was 2nd February. Belated birthday greeting to Eric. Hopefully Jaguar Heritage has accepted him so the Heritage Certificate will be his birthday card and gift. His personal details are that he was sent over to British Leyland New York for sale. No idea what went on over there but he changed colour from light green to red and became not much more than salvage when returned to the UK in 1989. He was bandaged up in Leeds (Aaah Yorkshire where you always get a good cup of tea). Dave Finch reckons you can always tell a Yorkshireman but you can’t tell ‘em anything. After acceptance by the Ministry of Transport and the HMRC circa 1992, now wearing a white suit, he had 3 owners I believe, before coming to me. There is no pictorial evidence of the restoration but there is a good history file re parts and trimming. He was in a sorry state. Sadly the last 27 years of road use has taken off his shiny edge and he now could do with another good makeover. He is fun to drive and makes me smile when I see him in his garage, which I call the E Bay. 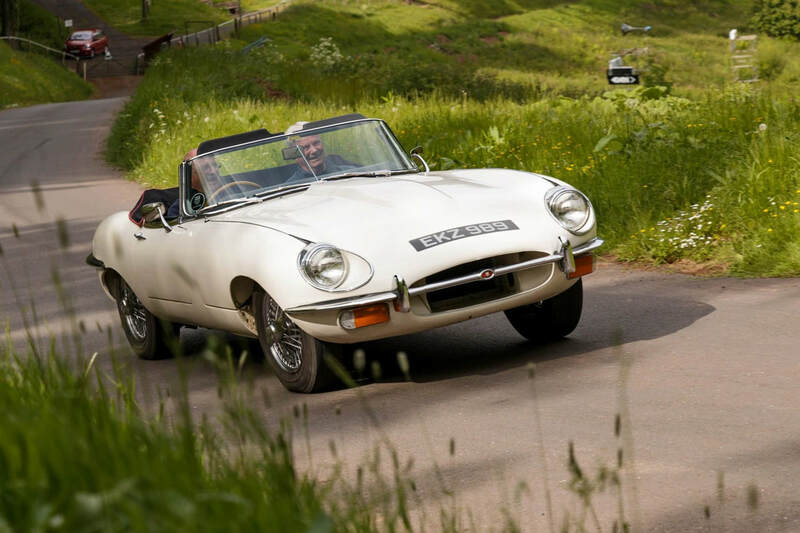 Photo of me taking him for a ride up Shelseley Walsh Hill Climb Course ( loitering by modern standards) my passenger being my Classic Car mentor, my friend and ex neighbour Graham White who sadly passed away in December.